The world of insects is a truly alien place. The last two decades of research have revealed many surprising similarities to our own world – e.g., finding that insects have both personalities and remarkably sophisticated behaviour, parallel to that of mammals or birds. And there are even suggestions that insects could show consciousness, something that nobody would expect. Twenty years ago, the multi-award winning series ‘Alien Empire’ brought the world of bugs alive in a whole new way. But a lot has happened in 20 years, both in the world of bugs and in camera and computer technology. Many remarkable stories have emerged, providing a lot of opportunities. This series will feature the very latest science and new discoveries, filmed in a cinematic – and often humorous – style. Modern camera technology allows us to capture this behaviour in ways we could never have imagined before. New techniques, such as electron microscopy, confocal microscopy and computer-aided enhancements means there are no limits to our journeys into the cosmos of insects. In three one-hour episodes, ‘Alien Worlds’ will use a very special approach and aspiration, as well as the latest technology to show the fascinating world that exists in parallel to our own. The biggest difference between our human world and the insect world is size. The first part of this programme explores the advantages and disadvantages of being small. It explores the sheer numbers of bugs and the problems of conquering the world when you are so small. And it will explore where insects came from – as well as the reasons behind their success. New research has shown that insects had evolved far earlier than we thought, conquering the land more than 400 million years ago. It didn’t take long for insects to take to the air, and now we can admire insect flight as never before. At the University of Berkeley in California, scientists have developed a cyborg beetle which carries an electronic backpack monitoring its flight, and allowing the scientists to steer the beetle in flight by triggering certain muscles. They can even make it hover. Being so small hasn’t limited insects in the slightest, even when it comes to brainpower. Our brains contain around 85 billion neurons, whereas a bee’s brain contains less than a million. Yet, bees perform well in cognition studies. Our brains might be big, but they are full of repeated patterns of neurons. In computer terminology, we might have bigger hard drives, but our main processors are no better than an insect’s. And new computer studies suggest that consciousness itself can arise with relatively small numbers of neurons – perhaps as few as 50,000. So, theoretically an insect’s brain has the capacity to achieve consciousness. Think about that the next time you swat a fly. The second part of this programme takes a look at the possibilities of parenthood: Insects succeed because they produce more insects. Some lay unbelievable numbers of eggs, such as queen termites that lay hundreds of eggs a day and may live for 50 years. We used to think this was the insects’ main strategy – so many eggs and young, so that some were bound to survive, not sophisticated enough to show parental care. Now all that has changed. Even insects that seem to be typical un-caring parents are actually not. We don’t know how, yet cricket mothers can pass on information about predators to their offspring, even though the eggs are abandoned as soon as they are laid. Meanwhile, burying beetles have parental care as sophisticated as birds. Both parents co-operate to keep a dead mouse clear of maggots and moulds and feed it to their young, calling to them to announce feeding time. 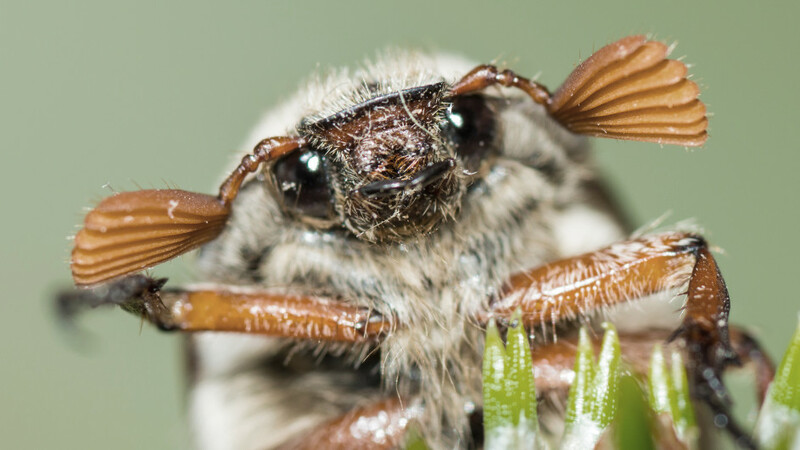 In order to produce offspring, insects need to find mates – and research over the last few decades has shown unexpected sophistication in this part of life, too. In South America, damselflies assess the strength of a rival and, if weaker, attack aggressively, wasting little precious energy by finishing the encounter quickly. But if the rival is stronger, the resident males perform a display flight, which is more energetic, but with less risk of injury. These strategies are as sophisticated as with vertebrates, but insects work out all the options with a brain the size of a pinhead. For many people, bugs are loathed – they infest our homes, eat our crops or turn a picnic into a nightmare. Insects in numbers are the main focus of the third part of this programme. Even today, vast swarms of Mormon crickets march across the western US, though surprisingly these marching hoards often leave plants untouched. They want protein and salt – the best source is the cricket in front – and thereby the army is kept on the march by a relentless pursuit of one cricket by another. Elsewhere, armyworms march in uncountable millions, devastating the crops of African farmers, whilst locusts ravage central Australia. Yet, some people are now seeing these huge numbers as crops themselves. America’s Institute of Food Technology is now seriously proposing a switch to insects as food. Insects need less land, food or water to produce a kilogram of protein than cattle or sheep and produce up to a hundred times less greenhouse gases. Worldwide, some 2,000 kinds of insects could become eco-friendly new food crops. But most insects benefit us in more benign ways. Recently, it’s been discovered that wild pollinators are far more effective than honeybees, even though beehives are big business in agriculture. We now know that crops of tomatoes, coffee and watermelons are limited by a lack of wild pollinators.